The tension is ever growing. The final battle between the Swords of Justice aka The Darkstars and The Shields of Justice aka The Green Lantern Corps is coming to ahead. A fight that started when a once proud Green Lantern fell to the darkside. Strange bedfellows rally together to prevent the ultimate form of Justice from taking place! Warning the following review will contain spoilers! So remember to read your comic before. You have been warned. Rafa Sandoval is the MVP. That statement isn’t meant to take away any credit from Robert Venditti’s excellent writing, but the art in this issue is just to gorgeous to not give a huge amount of credit to Sandoval. On a basic level certain comic readers will think a splash page is just a cool image with that being it’s sole purpose. A good splash or double page splash will not simply be a cool image, but it will evoke something or be the perfect release of tension and that release gives the splash page it’s merit. The buildup to Hal going mono y mono with Tomar-Tu is great. Hal’s confident posturing, fully accepting that the person he knew is long gone, allowing him to not hold back in the fight. The double page splash itself is pure dynamism, it’s a trope but I love the determined looks both combatants have on their face as they prepare to deliver blows. Even though this series is coming to an end, I hope Rafa Sandoval will go down as one of the best artist to ever work on Green Lantern. 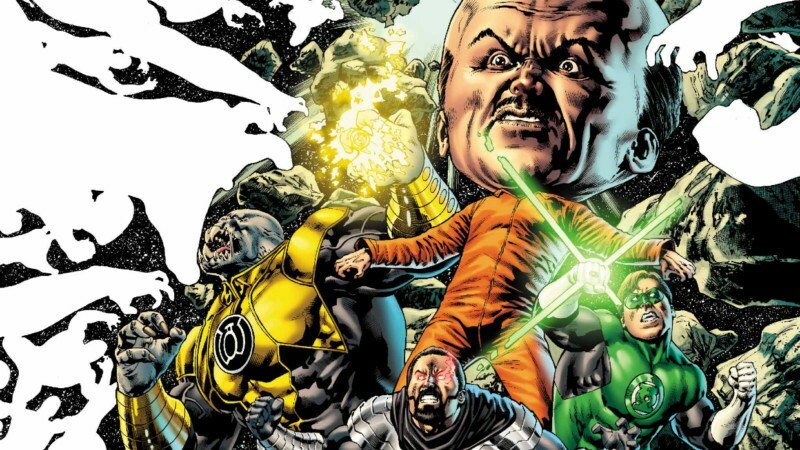 One of the best aspects of Venditti’s run will be his handling of each Earth Lantern’s characterizations. With this issue in particular, I want to bring your attention to John Stewart, while many readers are familiar with his time as architect or the marine, and depending on the writer one aspect will dominate over the other. Venditti combines both aspects of John and it brings out his inner master tactician but unlike most tacticians, John brings his personal baggage to his attack strategy, confident yet not unaware of how quickly the tide of battle can turn. While I don’t want my heroes to constantly have crippling self doubt, the small moments of doubt do bring that small pinch of reality that certain scenes in comic connect with the reader. Huge battle sequences that featuring large armies can fall into either one of two camps. It’s really compelling as you deeply examine each panel to absorb each aspect of the battle or done poorly that you have no earthly idea how to process what you’re seeing. Instead of trying to overload readers with exposition, Venditti allows the fight to breathe and flow effortlessly, a couple of moments that deliver a near perfect break in the action. What really made me enjoy this epic clash of armies was that as the issue progressed, the scale started to become smaller, until it became only about Hal and Tomar-Tu. Grab your readers with flash battle sequences, then make them invested. I’m going to miss what Venditti brought to the Green Lantern mythos, and I can’t wait to see the explosive finale.